Between 1846 and 1848, a war fought between two North American nations, the United States and Mexico, did what most wars do- it began with a bullet, it took lives, it ended with a treaty, and it made its mark on history's timeline. Yet, it often seems to be a mark whose boldness is not perceived. Often confused with the Texas Revolution or the Spanish-American War, the Mexican-American War is a piece of history whose significance should not be rewarded with insignificance or confusion, but rather a knowledge and understanding of the event itself, its precedents, and its lasting effects. The content of this site provides a variety of insights and overviews into many things surrounding and included in the Mexican-American War. 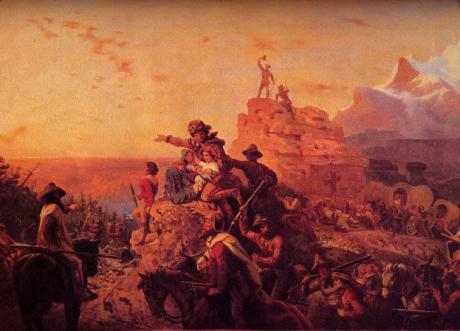 Beginning in the mid 19th Century, its roots took hold in the United States' Westward Expansion and the value that both nations had for land. With James K. Polk residing in the presidency over the U.S., and Mexico's government undergoing a series of shifts in leadership during this time, the armies of both countries met in southwest Texas, at the Rio Grande River, and began a war that would last 21 months, incur many battles, be fought mostly on land, and result in an end to the Texas/Mexico border dispute as well as an enourmous shift in land. This shift went in favor of the United States, whose victory claimed them the entirety of its current southwest region, and the Rio Grande River as Texas' southwest border. Yet the war cost both countries pricetag of pain and frustration- not only in the number of lives is cost them, but also in the forced mergence of two cultures, neither of which was ready to, or knew how to, respectfully deal with the obstacles that would arise. The war left an entire poplutaion of people living in a country with a new name, many of whom lost their land as well, and in the midst of tension and bitterness, everyone was challenged by new cultural surroundings and the subsequent re-establishment of their own personal identity.